Call (616) 632-7200 weekdays from 8-12 or 1-5 to make your appointment. Fees: $39-$55 for injectable vaccine and $41 for FluMist (nasal). They will bill Medicaid and Medicare for adults and children, but they do not bill private insurance. Children 18 years and under may qualify for free or reduced cost vaccine. Qualifying for this special program will be assessed at your appointment. Flu season is fast approaching. While Kent County has not had any cases reported at this time, now is the time to schedule an appointment to get immunized. 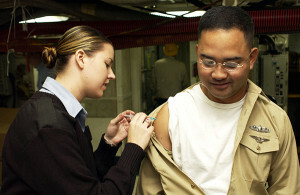 The Kent County Health Department seasonal influenza program provides vaccinations for all individuals six months of age and older. The cost of the vaccine is $25 for injectable three strain vaccine, $29 for preservative free three strain vaccine, $30 for preservative free four strain vaccine or $33 for FluMist nasal spray (a live, preservative-free, four strain vaccine). “Last season, there was a steep increase in the number of confirmed flu cases in Kent County, in comparison with the 2011-2012 season,” says Adam London, Administrative Health Officer for the Kent County Health Department. “Last season’s flu packed quite a punch for those who caught it. KCHD received dozens of calls from people looking to get vaccinated in December and January.” Since it can take about two weeks to become effective, now is the time to think about vaccinations. The flu can have serious complications for children under the age of five, the elderly, and people with already-weakened immune systems. The CDC recommends a yearly flu vaccine for everyone over 6 months of age to protect against flu viruses. The flu is a contagious respiratory illness caused by influenza viruses that infect the nose, throat, and lungs. Flu viruses can spread when people with flu cough, sneeze, or even talk. Someone might also get flu by touching a surface or object (like a phone) that has flu virus on it, and then touching their own mouth, eyes, or nose. It impacts schools and workplaces, but it can be prevented. The flu can cause mild to severe illness, and in some cases, it can be deadly. Signs and symptoms can include fever, chills, cough, sore throat, runny or stuffy nose, muscle or body aches, headaches, fatigue (very tired), vomiting and diarrhea (more common in children than adults). Not everyone with flu will experience all of the symptoms. Children from six months through eighteen years who have no insurance, or who have insurance that doesn’t cover vaccines, will pay a sliding scale administration fee of up to $15. The Health Department can only bill Medicaid and Medicare. Cash, check, MasterCard, Visa, or Discover are accepted. To make an appointment at any of our five clinic locations, call (616) 632-7200. You can also schedule online at www.stickittotheflu.com. Flu information is also available on our information only line at 742-4FLU (358). Most private insurance companies, Medicaid and Medicare cover the cost of mammograms. However, if you are someone that is not covered, the National Breast and Cervical Cancer early detection program provides screenings and diagnostic services to low-income, uninsured, and underinsured women. To find out if you qualify for a free or low-cost mammogram and Pap test, and where to get screened, call 1-800-922-6266.